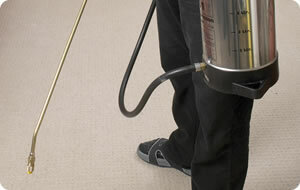 Our carpet cleaning & upholstery cleaning systems adhere to manufacturers recommendations and include commercial vacuuming, dry powder, foam, steam extraction and rotary brush methods. In addition, antistatic, protective and fire retardant finishes can also be applied. We can also supply entrance matting which can incorporate your company logo if required. The 10 Steps to successful carpet cleaning & upholstery cleaning using PROCHEM Extraction machines, the most effective cleaning method available. The purpose of a survey is to clearly establish the following: Soiling: Check the depth of soil and signs of permanent staining. Fixings: Check the condition of carpet fixings. Backings: Check the type of backing as many are prone to shrinkage or bleeding. Only from a survey can we select the most effective treatments and method. Before any cleaning can begin, all colours in carpets and fabrics must be pH tested to ensure that the dyes are colour fast enough to be deep cleaned. Fibre identification is also critical as it will greatly influence the chemicals and method of cleaning. Fibre testing will also assist in predetermining if a stain is permanent or can be removed. Preparation before cleaning largely determines its success and yet it is often dismissed by many professionals as unnecessary. Prior to power vacuuming the pile is reversed to release matted fibres for more effective cleaning. 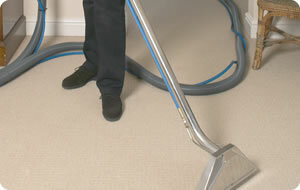 Before any extraction clean can commence, all the loose soil must be extracted from the fibres. Failure to follow this simple step will turn dry dust into mud which causes early re-soiling after the fibres dry. This leaves a dull overall result. 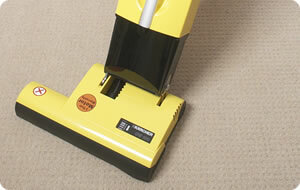 Prior to main cleaning any stains must be pre-treated with water based chemicals or solvents. This is always undertaken when the carpet is dry while the stain is clearly visible. The appropriate time must also be given to allow the cleaning chemicals to take effect. The most technically difficult area of carpet and upholstery cleaning is the correct selection and application of pre-treatment chemicals. Pre-Spraying is the application of chemicals that actually break down the dirt and hold it in liquid form until the extraction machine removes it. Only at this stage can the actual deep extraction cleaning begin. Clean Genie extraction machines then force temperature controlled water and neutralising detergents into the fibres before powerful twin vacuum pumps remove 90% of the injected water. Finally any inaccessible or delicate areas are cleaned by hand. A final inspection is made and processes 6-8 will be repeated on heavy traffic areas until the optimum result is achieved. 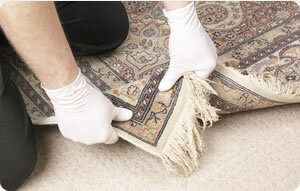 On the satisfactory completion, the carpet or fabric pile must be correctly set whilst damp. Depending on the methods used, drying times will be between 2-4 hours whilst the remaining moisture evaporates. A follow up call will be made to ensure your complete satisfaction.